Within each stage of growth there are four directions we must reach toward in order to grow: in, out, up and down. The following material is designed to help you reach out through fellowship. This survey is designed to measure your understanding and application of Christian fellowship. In Romans 15:1-6, Paul lists seven identifying marks of fellowship within the church. As each description is discussed, rank your achievement level on a chart that measures from 1 to 10. 1. “...bear the weaknesses of the weak” - In the Greek language, the word for bear is bastazein. It is the same word as is used of Christ bearing the cross. How often do you feel the pain of others and struggle under the load of their burden? 2. “Let each of us please his neighbor for his good to edification” - In the Greek language, the word for edification is oikodome. It literally means the things of building up. How effective are you at encouraging others and building them up? 3. “whatever things were written before were written for our learning” - In the Greek language, the word for learning is didaskalia. It means teaching or instruction. Fellowship is based upon learning from scripture and the application it makes in the lives of our family. How effective are you as a learner? 4. “That we through patience ... might have hope.” - In the Greek language, the word for patience is hupomone. This word means far more than patience. Hupomone is victorious adequacy that can cope with life’s struggles. How spiritually adequate are you? How effective do you use this inner strength to encourage others in fellowship. 5. “That we through ... comfort of the Scriptures might have hope.” - In the Greek language, the word for comfort is paraklesis. It literally means to call beside. Consolation often comes by calling to one’s side an aid or comforter. How effective are you at giving consolation? 6. “That we ... might have hope” - In the Greek language, the word for hope is elpis. Biblical hope is not wishful thinking or playing the odds. Biblical hope is confident expectation. Do you confidently expect the blessings of Heaven? How effective do you use this confident expectation to encourage others in fellowship. 7. “Now may the God of patience and consolation grant you to be like-minded toward one another” - In the Greek language, the words for like-minded are auto phroneo. They mean to think or be minded in a common way. Although fellowship does not demand perfect agreement, it does require harmony. There will always be differences of opinion, but those who are within the bonds of Christian fellowship have solved the problems of living together. They are confident that the unity they have in Christ is far greater than any difference that might divide them. How complete is your like-mindedness with fellow Christians? As Romans 15:1-6 concludes, Paul points out the ultimate result of effective Christian fellowship, “...that you may with one mind and one mouth glorify the God and Father of our Lord Jesus Christ.” The supreme goal of all Christian fellowship is unity in praise of God the Father. How complete is your unity with God’s family? It is very important that this activity not be shuffled to the bottom of your “to do list.” Tape the list to your bathroom mirror or the monitor of your computer. This assignment must have your attention. You cannot effectively follow God’s blueprint for growth if you do not engage in activities such as this. For God’s sake and your own spiritual development, post this list in an obvious place. Next time we will look at a biblical survey that can help you grow as a leader by reaching up in worship. Until then, keep the faith! Back to Top of "Keep the Faith! 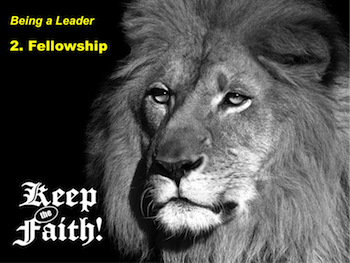 Being a Leader 2: Fellowship"